In May of seventeen eighty-seven, a group of America's early leaders met in Philadelphia. They planned to make changes in the Articles of Confederation, which created a weak union of the thirteen states. But instead of changes, the convention produced a new document. This week in our series, Frank Oliver and Richard Rael continue the story of the United States Constitution. Last week, we told how the convention reached agreement on a national judiciary. Delegates approved a Supreme Court. And they agreed that the national legislature should establish a system of lower national courts. The national executive -- or president -- would appoint the judges. These courts would hear cases involving national laws, the rights of American citizens, and wrongdoing by foreign citizens in the United States. The existing system of state courts would continue to hear cases involving state laws. We also told how the convention heard different proposals for a national government. Virginia and New Jersey offered their plans. Alexander Hamilton of New York presented a third proposal. It would give the national government almost unlimited powers. Hamilton's ideas were not popular. After Hamiliton's five-hour speech, one delegate said, "Hamilton is praised by everybody. He is supported by no one." Delegates voted to reject the New Jersey Plan. They did not even vote on Hamilton's plan. From that time, all their discussions were about the plan presented by Virginia. 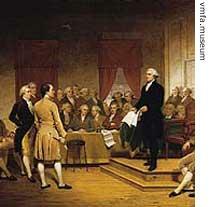 The delegates began to discuss creation of a national legislature. This would be the most hotly debated issue of the convention. It forced out into the open the question of equal representation. Would small states and large states have an equal voice in the central government? One delegate described the situation this way. "Let us see the truth," he said. "This is a fight for power, not for liberty. Small states may lose power to big states in a national legislature. But men living in small states will have just as much freedom as men living in big states." The issue brought the deepest emotions to the surface. One day, Gunning Bedford of Delaware looked straight at the delegates from the largest states. "Gentlemen!" he shouted. "I do not trust you. If you try to crush the small states, you will destroy the confederation. And if you do, the small states will find some foreign ally of more honor and good faith who will take them by the hand and give them justice." The debate on legislative representation -- big states against small states -- lasted for weeks that summer in Philadelphia. Delegates voted on proposals, then discussed other proposals, then voted again. By the beginning of July, they were no closer to agreement than they had been in May. As one delegate said: "It seems we are at the point where we cannot move one way or another." So the delegates did what large groups often do when they cannot reach agreement. They voted to create a committee. The purpose of the committee was to develop a compromise on representation in the national legislature. The so-called "Grand Committee" would work by itself for the next several days. The rest of the delegates would rest and enjoy themselves during the July Fourth holiday. July Fourth -- Independence Day. It was a national holiday in the United States. It marked the eleventh anniversary of America's Declaration of Independence from British rule. It was a day for parades, fireworks, and patriotic speeches. The celebration was especially important in Philadelphia. It was the city where the Declaration of Independence was signed. Now it was the city where a new nation was being created. Convention president George Washington led a group of delegates to a ceremony at a Philadelphia church. They heard a speech written especially for them. "Your country looks to you with both worry and hope," the speaker said. "Your country depends on your decisions. Your country believes that men such as you -- who led us in our war for independence -- will know how to plan a government that will be good for all Americans. "Surely," the speaker continued, "we have among us men who understand the science of government and who can find the answers to all our problems. Surely we have the ability to design a government that will protect the liberties we have won." The delegates needed to hear such words. Just a few days before, Benjamin Franklin had expressed his thoughts about the convention. He was not hopeful. 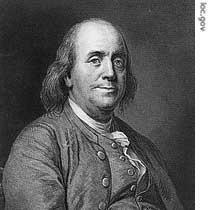 Franklin said: "We seem to feel our own lack of political wisdom, since we have been running around in search of it. We went back to ancient history for examples of government. We examined different forms of republics which no longer exist. We also examined modern states all around Europe. But none of these constitutions, we found, work in our situation." Franklin urged the convention to ask for God's help. He said each meeting should begin with a prayer. Hugh Williamson of North Carolina quickly ended any discussion of Franklin's idea. His words were simple. The convention, he said, had no money to pay a minister to lead the delegates in prayer. The convention returned to its work on July fifth. 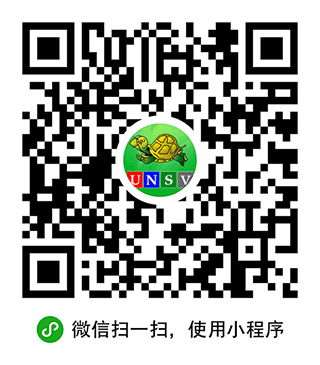 Delegates heard the report of the Grand Committee about representation in the national legislature. The report had two proposals. The Grand Committee said both must be accepted or both rejected. The report described a national legislature with two houses. The first proposal said representation in one house would be based on population. Each state would have one representative for every forty thousand people in that state. The second proposal said representation in the second house would be equal. Each state would have the same number of votes as the other states. The convention already had voted for a national legislature of two houses. It had not agreed, however, on the number of representatives each state would have in each house. Nor had it agreed on how those representatives would be elected. The proposals made by the Grand Committee on July fifth were the same as those made by Roger Sherman of Connecticut a month earlier. In the future, they would be known as the "Great Compromise." 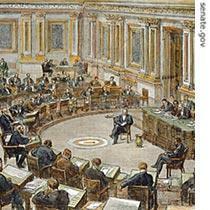 Delegates debated the compromise for many days. They knew if they did not reach agreement, the convention would fail. Those were dark days in Philadelphia. Later, Luther Martin of Maryland noted that the newspapers reported how much the delegates agreed. But that was not the truth. "We were on the edge of breaking up," Martin said. "We were held together only by the strength of a hair." Delegates Robert Yates and John Lansing of New York had left the convention in protest. But George Mason of Virginia declared he would bury his bones in Philadelphia before he would leave without an agreement. Even George Washington was depressed. He wrote to Alexander Hamilton, who had returned to New York temporarily. "I am sorry you went away," Washington said. "Our discussions are now, if possible, worse than ever. There is little agreement on which a good government can be formed. I have lost almost all hope of seeing a successful end to the convention. And so I regret that I agreed to take part." During the summer of seventeen eighty-seven, the delegates argued long and hard about how much power to give a central government. But that question was not the most serious issue facing the convention. Many years later, James Madison explained. He said the most serious issue was deciding how the states would be represented and would vote in a national government. That question, he said, was the one which most threatened the writing of the Constitution. Our program was written by Christine Johnson and read by Frank Oliver and Richard Rael. Join us again next week for THE MAKING OF A NATION, an American history series in VOA Special English. Big states and small states argued their power in the convention. It was on during a month. Many people lost their hope and contained the president George Washington. The meeting had came to a dangerous cliff. "Let us see the truth. This is a fight for power, not for liberty. Small states may lose power to big states in legislature. But men living in small states will have just as much freedom as men living in big states." How nice are those words! and how sneaky is the one who give them! Without equal power, how come each one has the same liberty? the most serious issue was deciding how the states would be represented and would vote in a national government.